Once you have kids the opportunities for partying can be a bit limited. 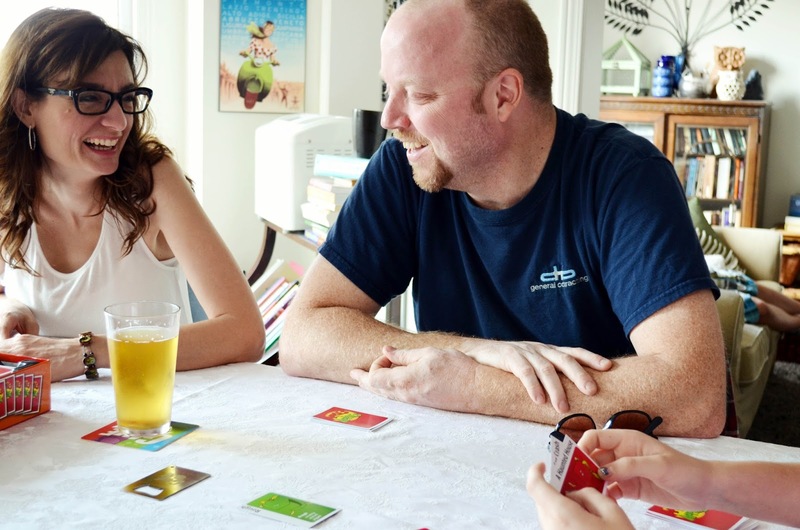 Fortunately a party based on board games works for people of all ages, whether college kids, families with little ones or members of the Red Hat Society. 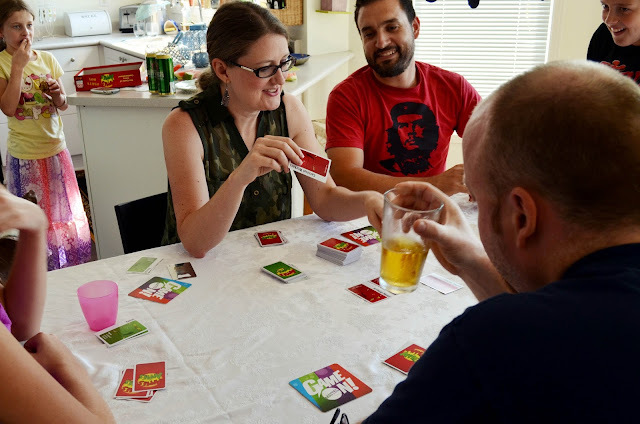 My husband and I invited some family members over for a "game on" party recently. My sister-in-law is a game lover so she was all in. She's the type who wants to play charades at family gatherings. Unfortunately her wish is not often indulged. 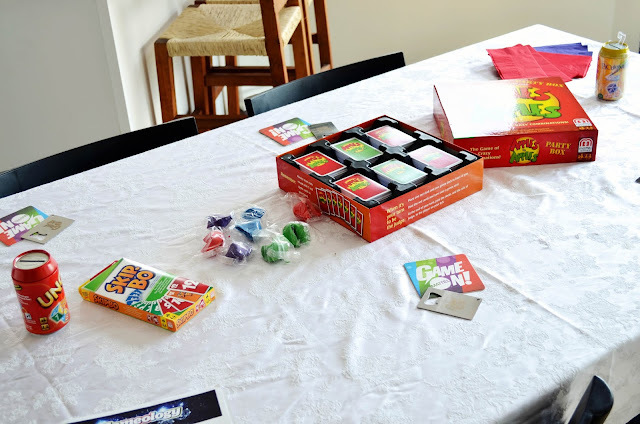 We set out a few games on the kitchen table, including Apples to Apples, Skip-Bo, Pictionary (in a can) and Uno (also in a can). 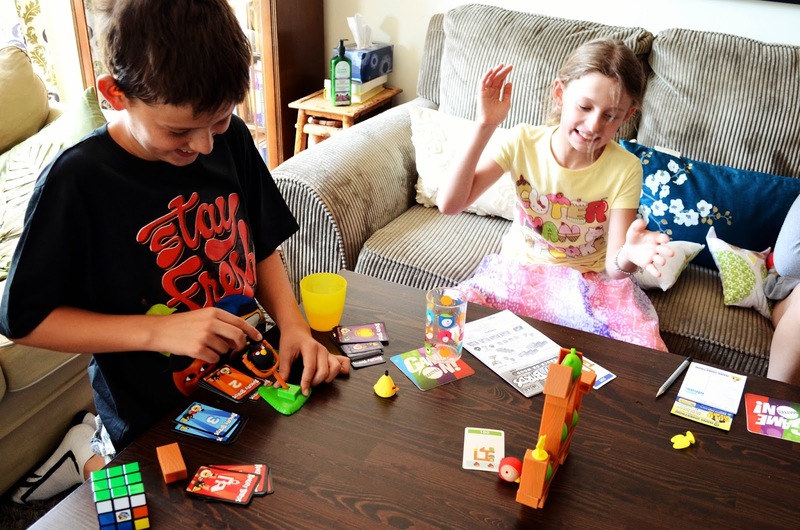 We also put out an Angry Birds game on the coffee table for the kids to enjoy. 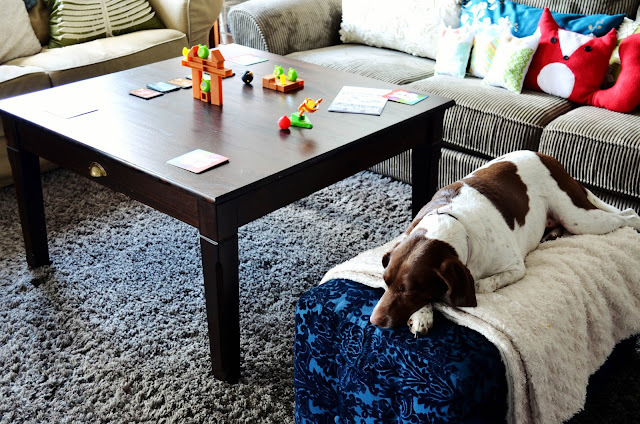 You can see that Jolene the beagle mix was excited about the party preparations. Of course any good party has to have food. 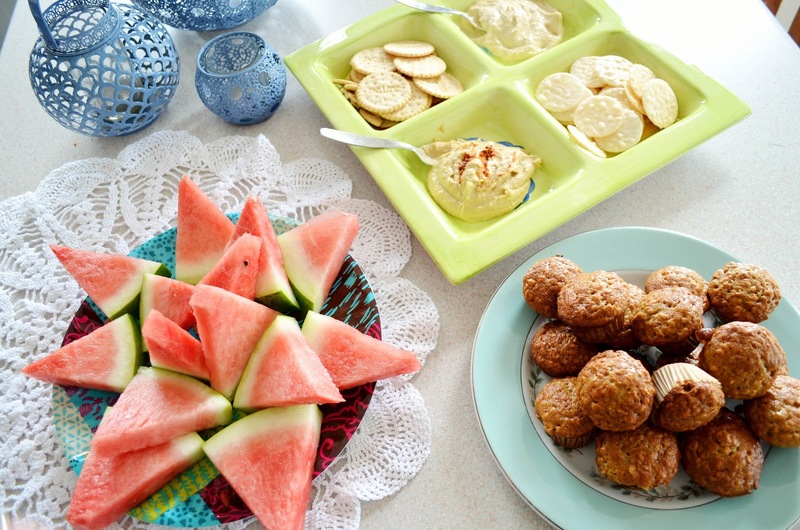 We decided on mini banana muffins, watermelon and hummus with crackers. The kids enjoyed launching the angry birds and trying to knock down the green pigs. 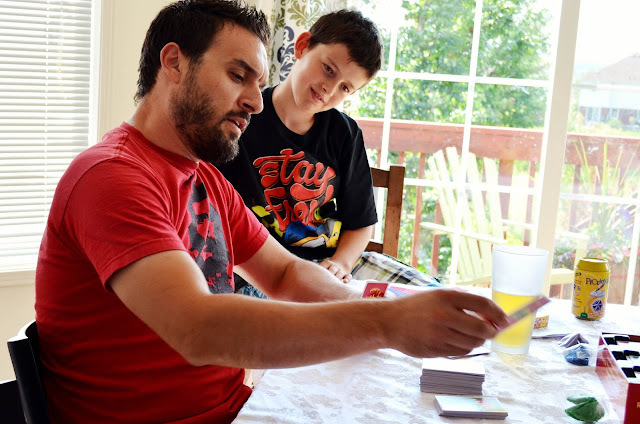 The game kept them suitably occupied so we parents could play a round of Apples to Apples. If you're not familiar with Apples to Apples, here's a quick explanation. Each player receives seven red apple cards. Each card has a noun or noun phrase on it. One person acts as judge, turning over a green apple card on which is printed an adjective. Each person chooses a red apple card from their hand that they feel best goes along with the chosen adjective. The judge decides which red apple card is the best. The winner of that round gets the green apple card. Play continues on until someone gets an established number of green apple cards. It's a simple concept that ends up being lots of fun. You can put down your red apple card anonymously or lobby for the judge to choose your card (and maybe poke fun at other people's choices). Playing with kids is interesting. Putting down that "Michelle Pfeiffer" or "The 1920s" red card won't get you a win with a young judge. Part of the strategy becomes trying to guess what the judge would be likely to pick based on their personality and interests. 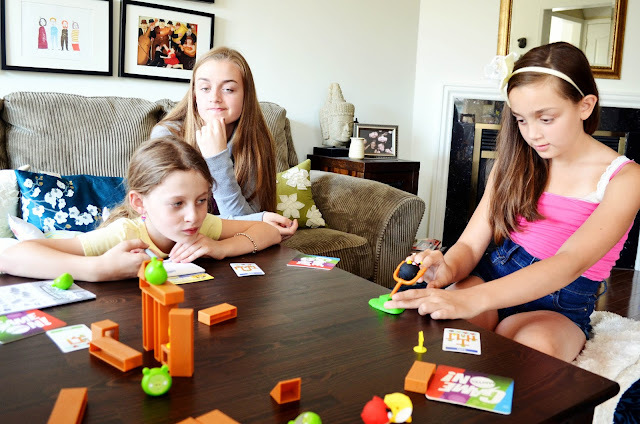 Mattel recently launched the Gameology Facebook App. It determines your "game sign" to tell you what type of player you are and which games fit you best. Turns out I'm a Strategicorn - someone who patiently waits for the right moment to strike. 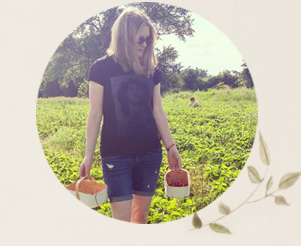 You might be an Activius, with great physical prowess and a preference for games that require your hands. Mattel's party planners suggest creating wacky party rules for your games party. Think of funny roles for each of your party guests and assign them when they arrive. Maybe someone has to use an Irish accent throughout the party or play a certain character and have other guests guess who it is. Are you a fan of board games? Do you ever have gaming parties? We love games - that's why we have a game room!! Although,we never played a game all summer because we were so hooked on The Sopranos!! 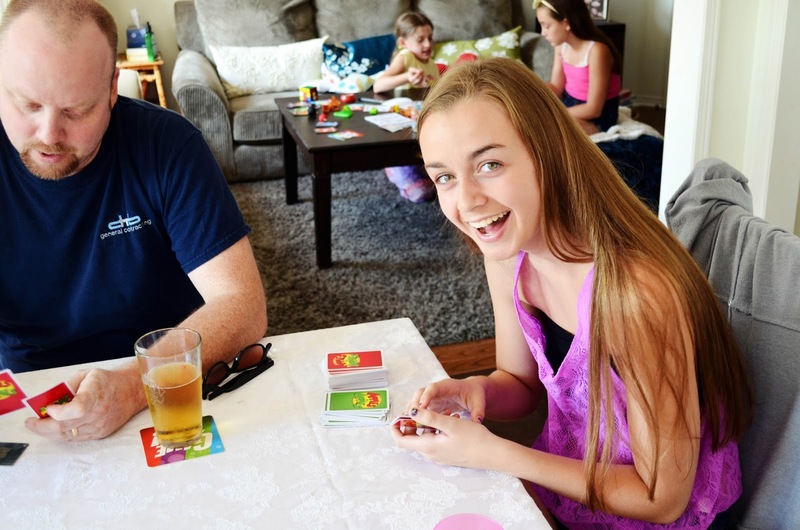 Carla has Apples to Apples, it was a new game at Christmas, we liked it!! Isn't that just the problem? The TV is so addictive. But I love that you have a games room!! Great pics too to make great memories. I know what you mean. If we don't have to get the kids off to dance or basketball or soccer, the evening feels lovely and long! :) Happy September too Angie!